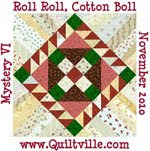 Jackson Patch Quilting: I Disappeared Again! Well, I disappeared again. 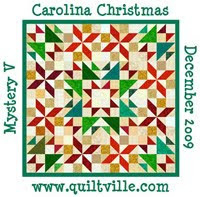 I am finished with Quilters of South Carolina Spring Meeting registration. YEA!! Just a few tiny things left to do. Spring Meeting is on March 24. Hope to see ya there. Then, I got the cold from H**L! DH had it while I was at Joyce Greer's quilt camp. Well he started with it before I left. Of course, I got it after I got home. One week of misery. At the end I sneezed for 2 days. I mean hard multiple sneezes. You know the kind that makes your ribs hurt. Benedrill was the only thing that saved me, but I slept for 2 days. Well, I am over that and I feel better than I have in a long time. All that sleep was great. Now time for some pictures to catch up on posting. This is Mary's star that she was working on. It is made with half square triangles. She was auditioning more fabrics. I do like it. Helen's project. Her own design. She ran out of purple fabric for the border, so it will be added at home. This is really a neat quilt. Made from Jelly Roll, too. 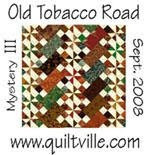 Mystery, Mystery..... Beth Karr had a mystery quilt for every one at camp. I didn't do it because I had something else that really needed done..tell you about that in a minute. This is a nice quilt. You can make 6 blocks and have a lap or baby quilt. Or make all 12 and have a full size quilt. It is on my to do list. Mary and Rhoada, I am not sure which Rhoda this is, so if I spelled the name wrong, please forgive me. Rhoada and Rhoda are twins. The love shop hops, FARTS (fabric acquisition trips) and a little wine. So, now it crash time. Sleep well. Lots of eye candy. All very pretty especially Autin's quilt.